If you control a Secret at the end of your turn, restore 4 Health to your hero. "LUMOS!" is not what they yell. What do you think this is, Hogwarts? Do the two new League of Explorers secrets combo with this card? Sacred Trial won't trigger until your opponent plays his fourth minion to the board and Dart Trap lies waiting for your opponent to Hero Power. There aren't enough anti-Secret cards. Kezan Mystic is brilliant, and that's all we got. With all the pro-Secret synergy we need more counterplay. "Illuminator". Illumination should illuminate secrets. Conceptually it makes more sense. Shores up very well against aggro decks if you play it in mage. An aggro deck can't let this guy stick around, and a 2/4 will often trade for two attacks or demand a pump effect and one attack. In any case, it is frequently an eight-point life swing and that is pretty good for only three mana. Works best in mage as you can ping the survivors and have a very persistent secret with the ice block and the mage doesn't really have a lot to do with three mana besides playing secrets. Finally, even without a secret the card is still a reasonable body on turn 3. I love the golden version. I've been trying to make a viable control hunter, not just a midrange that plays highmane. I think this goes a long way in making that a possibility. I, for one, am REALLY hoping that one of the cards added is a neutral card/minion that flat-out destroys all enemy secrets. I hate constantly getting into a situation where I only have 1-2 4-6 mana drops in my hand and I KNOW the opponent has Mirror Entity (That or Ice Block, but few people use the latter). What exactly am I supposed to do, doubly so given the enemy mage flamestriked my side of the board...this will just give MORE value to secret-running decks, so I'm hoping that non-hunters get a way of destroying them. Sorry if that sounded ranty, but you can probably tell that I HATE playing against mages. They always have a counter to ANYTHING you do. It's too early to tell if this card will get any play, but I like it. It's quite good in more control oriented mage decks. Play it turn 3 and trade the mad scientist from turn 2= better value than farseer. if you've taken any damage at that point in the game. It's not playable in every deck, but in the decks that it CAN be played in, it is quite good if you need healing. definitely good for freeze mage and secrets mage, and I can see this in a control hunter or paladin, but I otherwise feel this minion has a somewhat OP effect, and good trading stats. definitely could be a hidden gem, and getting 2+ turns of heal out of this from a freeze spell, or from behind a taunt like annoyo or sludge, this is going to get used. is it going to be good? time will tell. the biggest issue I have with the card is that it gives absolutely nothing to classes that don't have secrets, and for some classes like warlock and shaman, where they would welcome a repeating healer, they can't do anything with it. It's also good in control pali that runs secrets, but not worth running over aldor/pyro etc, might see play in control pali as an anti-agro card (2-4 is better vs agro than 3-3). Obviously it is bad in hunter and agro mage and shockadin. people keep complaining about the stats but they really arent bad 2/4 for 3 is the same as old dalaran mage, i mean it trades with most 2 and 3's and standard 3 drop is 3/3 with an effect this is 2/4 still same number of total stats. the problem isnt with the stats i think but that the ability is pretty underwhelming. More value to the Cabal Shadow priest. The body is a little on the fragile side, and the deck that could potentially utilize it the most (Mage) has much better 3 drops to be placing down, including a 3 drop secret. For a Paladin who uses a lot of 1 drop Secrets, the problem is those secrets are easily trigger-able and you are probably playing aggro-din, so you may get a 4-point heal but it is not progressing your game plan at all and you wasted a 3 drop on a pretty non-aggressive critter. Who knows what other secrets will be printed, but as of now, this is a very sub-optimal card. 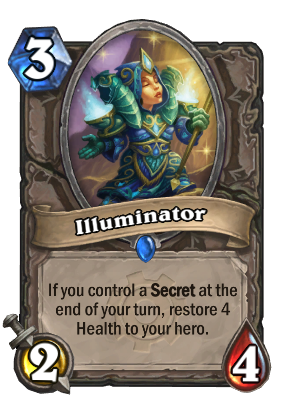 I hope they add more cards like "If your opponent has a secret gain +2/+2" or "If your opponent has a secret do +X amount of damage" or a freeze trap counter "If your opponent has a secret this card costs 2 less!" As a Hunter fan, I look forward to utilizing this, and destroying other peoples traps. I love this! Really this isn't that good. Cabal shadowpriest will take it, Kodo destroys it. This wont get more than 1 heal off most likely. In secret mage I rather play the 4/3 that gives free secret or the 3/3 that buffs to 5/5. In Hunter decks healing isn't important and 2 attack isn't enough tempo. To be honest it is most useful in a mage deck. Mage has the only secret which may not trigger for a long period of time, in fact only when he takes lethal damage. Could heal up non stop, BUT: this minion can be taken out very fast. I do not consider the light well a broken card as well.